InVogueJewelry: Buying Sapphires from Sellers in Thailand---Risky? Buying Sapphires from Sellers in Thailand---Risky? Thailand was always known for their beautiful sapphires and rubies. Thailand was formerly known as Siam, and Siam rubies were known for their fabulous "pigeon's blood" red color. Burmese and Siamese rubies are beyond beautiful and are found in the Crown Jewels of the UK and other countries. Lately, I've seen some "sketchy" stones being sold by sellers in Thailand, who seem to always describe the gemstones' origins as "Africa". They also describe the stones as being "heat treated". 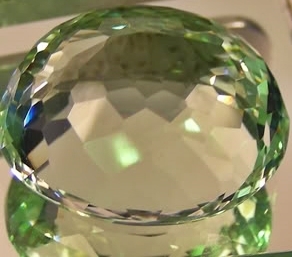 Now, there are still MANY legitimate gemstone dealers in Thailand. But these few "bad apples" have really spoiled the barrel, for me anyway, and apparently some other buyers as well. Someone on ebay wrote about this, and it's very interesting, and it's exactly what I have seen as well. Basically, this person's experience with 20 sellers in Thailand resulted in receiving 72 stones that were glass, 32 stones that were hydrothermal quartz, and 7 stones that were doublets---all advertised as sapphires or rubies. And ALL of these sapphires were of "African" origin, they stated. When this person (a gemologist who is also the CEO of a gem company in the US) confronted the seller(s), they told him, "Oh, we sent you the wrong package!" WOW, that's bad. There is an auction site online that offers jewelry and loose gemstones. This site is inThailand, and it seems that some of the stones are authentic but some are obviously not---"too good to be true" deals, with "Africa" as the country of origin on almost all of the gemstones. Some stones are SO obviously fake, such as a "deep blue green amethyst" (no such stone!!) or an 18 carat "blue green aquamarine" for $17.99. I've also noticed that these fake stones are always described with "flowery" adjectives, such as "Ravishing Ruby" and "Scintillating Sapphire" and "Majestic Blue Tanzanite" and so forth. Apparently, when you read further, "Ravishing" and "Extreme" and "Majestic" etc. are the words to describe the LUSTER! Yeah. Here's a picture of an "Extreme Green Aquamarine" (right) weighing in at 12.82 carats for $12.99. I'm sure you can SEE this is glass, and you know that Aquamarine isn't green...yikes. It is of course described as "African" (ALL of these fakes are all "African"---I wonder why). 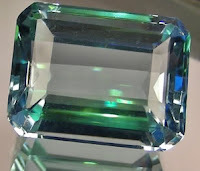 Above is a "gleaming aquamarine", nearly 13 carats for $12.99, with vivid deep blue and kelly green. It looks like one of those glass "ametrines", and certainly looks like glass to me!